Kit: Someday they're gonna kick the French out of this country. Port: Well, with trousers like that, who can blame them? American-born author, composer and poet Paul Bowles first discovered Morocco in the 1930s on a suggestion by Gertrude Stein, while he was travelling and studying under Aaron Copland. After a successful career writing scores for numerous ballets, films and Tenessee Williams plays, Bowles returned to Morocco in 1947 with his wife, author Jane Auer. Settling in Tangier, he took up writing again, penning his first novel, The Sheltering Sky, which was published two years later, and has since been recognized as one of the top 100 works of twentieth century literature. In 1991, Italian director Bernardo Bertolucci adapted the novel to the screen, with Bowles himself providing the narrative voiceover. 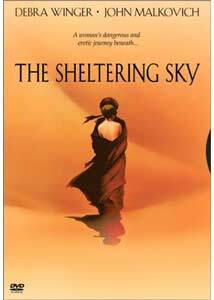 The Sheltering Sky takes place in the years shortly following the second World War. Leaving behind a life of indolence in their native land, three Americans arrive in Africa to set out on an adventure, as perhaps the first Westerners to return to the continent since the war. Port Moresby defines himself as a "traveller," one whose journeys need not have a point of return. His wife Kit describes herself as "half and half," somewhere between the carefree wanderer of her husband and the more definite "tourist" that their uninvited companion, George Tunner, embodies. As intellectuals and authors, the Moresbys have come to this exotic location to search for some element that will rekindle their ten-year marriage and free them of the underlying tension that haunts them. Tunner's inclusion is very much a lark, escaping the boredom of societal high life, and the Moresbys plot to rid themselves of his presence as soon as possible. Almost immediately they are set upon by another pair of ex-patriots: a hideous man in both appearance and character, Eric Lyle, and his mother, who claim to be creating a travelogue, but whose intentions may be more parasitic than anything else. Losing patience with city life, the Moresbys decide to head into the desert, but their plans for doing so together fall apart when the means of travel requires enduring either the train—which Kit is morbidly afraid of—or the company of the Lyles. After reuniting at their next stop, Port and Kit reaffirm their love for each other, but the African desert has its own plans for the pair. As their wandering continues, the drift further from their past and their insignificance in the grand scheme of things is made clear with deadly decisiveness. Bertolucci's films rely more on character study than action or plot, which for some may mean the story drags. For others, it is that depth of character and immersion into the world and minds of the players that captivates, and here we witness the lives of the principles as their story weaves to its inevitable conclusion. While the film begins as a story of the Moresbys, peeling back the layers that makes up their lives, it evolves into the experiences Kit faces as she finds herself in an alien world, without the familiar comforts of language and culture. From trying to maintain a fa�ade of the tangibility to her marriage, to her sojourn into the desert, she becomes more and more consumed by her environment and further detached from anything resembling conventional normalcy. Malkovich and Winger excel in their roles, he as an unpleasant and grating character, and she as a woman slowly retreating from anything within her former experience. The supporting parts are equally well cast, from Timothy Spall's repugnant Eric, to Campbell Scott's (son of George C. Scott) cautiously adventurous Tunner, fascinated by Port while being drawn to Kit. Although The Sheltering Sky is steeped in cinematographer Vittorio Storaro's luscious imagery of the North African landscape, basking in amber hues and a glorious richness of color, the film is also permeated with a darker, more sinister experience, juxtaposing the poverty of the narrow streets in somber greyish tones, seething with flies and disease. From expansive crane shots to tight, detailed portraiture, the camerawork conveys a sense of claustrophobia even amidst a seemingly boundless background. Set against Ryuichi Sakamoto's award-winning score, the visuals combine in an atmosphere of listless, emotional emptiness that becomes an hypnotic and voyeuristic plunge into the alienation of its characters. It is a love story with an aftertaste that is haunting and unforgettable. Image Transfer Review: Presented in its theatrical 1.85:1 aspect ratio, this is a beautiful anamorphic transfer befitting the film's exquisite cinematography. Colors are magnificent, capturing both Bertolucci's uniquely warm desert tones, and the greenish-greys with which he contrasts them. Black levels are strong, with good shadow detail. The image looks natural in its detail, sharpness and grain level, and print defects are few and far between. Audio Transfer Review: The stereo surround track is presented well, with a full and rich tone and appropriate directionality. Ryuichi Sakamoto's intoxicating score is finely detailed with exotic instruments. There are only a couple of instances where dialogue becomes distorted, otherwise it is clear and easily discernable. Extras Review: A brief but fairly decent six-minute "making of" featurette is included, along with the film's theatrical trailer, a list of awards, and select film highlights for Winger, Malkovitch, Bertolucci and screenwriter Mark Peploe. Saturated with beautiful cinematography, The Sheltering Sky presents a tragic love story, both evocative in its telling and disturbing in its substance. Bertolucci captures exceptional performances from his stars, perfectly blended with exquisite, exotic settings and an engulfing soundscape. While it may not capture all the subtlety and nuance of its literary source, it is a powerful and majestic film, and one that will leave a lasting impression. Recommended.